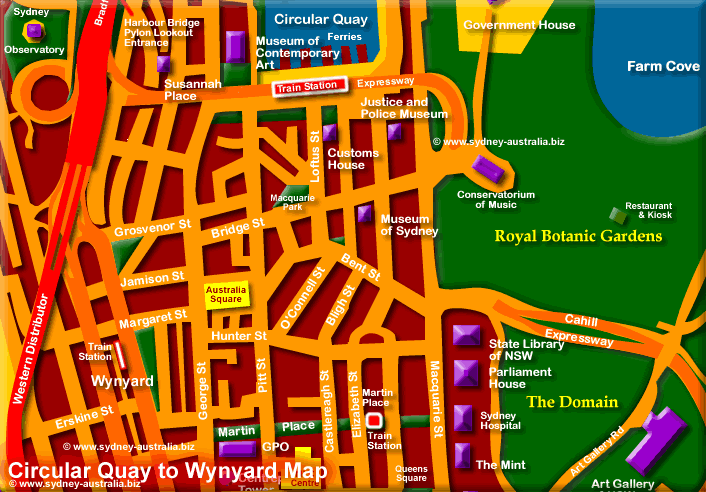 Map showing Circular Quay (above ground) and Wynyard (underground) train stations, two of the main transport hubs in Sydney Australia. Circular Quay has all the Sydney ferries that will take you to Manly beach, Parramatta, Darling Harbour, Balmain, Taronga Zoo and various Sydney northern suburbs. There are also taxis, while buses from here can take you to places like Bondi Beach and the eastern suburbs. As well as taxis, there are buses that head to the northern suburbs from Wynyard, including the Sydney northern beaches and places like Manly Beach, Palm Beach and Newport. Sydney trains heading north from the city stop at Wynyard for suburbs including North Sydney, Chatswood and Hornsby. Also trains heading west can be taken to Parramatta, Strathfield, Cabramatta and Penrith. Bondi Beach by train: take the train from Town Hall to Bondi Junction. From there, there are frequent buses that take you to Bondi or other beaches along this part of the Sydney coast. NSW and Sydney Museums: NSW Museums.